I’m a fan of food, there is no doubt about it! Greek food has a special place in my heart and my gut! I frequent Tempe restaurants, because I live in the area so it’s convenient. There was a time when I ate plenty at My Big Fat Greek Restaurant off Mill. I had spent a lot of time on Mill, drinking, eating, dropping pick up lines, and roaming the streets. At the time that was the best Greek eats in town in my opinion. Fast forward a few years later, out of school, blogging for a living, and frequenting Mill less and less. I was hungry for some Greek Food but wasn’t in the mood to make the trip to Mill or deal with any crowds. 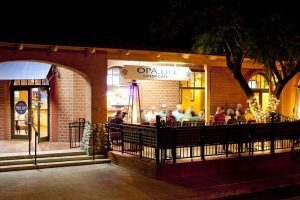 I jumped on my handy iPhone and searched for local Greek grub that had good reviews and lo and behold, there was Opa Life Cafe – The Best Greek Food In Tempe. I decided to drop in and check this spot out with the lady and we really enjoyed it. I had a Gyro and Greek fries and everything was pretty good, but nothing to write home to mom about. Then I started swinging by for lunch, setting up client meetings, and showing up a little more often which allowed me to try just about everything on the menu. 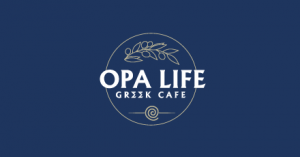 I wouldn’t say the Gyro is the best in town, but I would say that the Hummus dishes are superb and the grilled souvlaki dishes are amazing (especially the sauce)! They also have a creek chicken wing that is super solid, something you should try if you make the trip in. It’s got a decent environment with live music on Fridays and a pretty empty bar most of the time. I can come in here on a Sunday and watch Football and have little competition for seating or gas requests. It’s really a hidden little gem in Tempe. It’s located off of baseline and Mill in a strip mall (I’ll drop a map listing below). 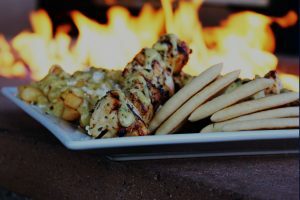 The appetizers are good, drinks are poured with love, and the tap selection is decent enough. There are a few local beers on tap and some domestics in bottles. I haven’t tried the desert yet but have overheard people dining raving about it. This is also a small chain here in the Valley, there is another location out in Glendale I think (just Google it). I have also met the owner a few times, seems like a pretty cool cat. Overall the staff and environment is pretty friendly. I would recommend it to anyone that likes good food, or wants to try something new. In addition to Greek food they sell wraps and burgers as well. If you are in Tempe anytime soon and want to give it a shot I think you will agree with me that it’s worth checking out. If you drop in and like it, leave us a comment below and let us know!